Faber, a professor of astronomy and astrophysics at University of California Santa Cruz (UCSC), was honored for her contributions to scientific progress in understanding the history and structure of the universe. 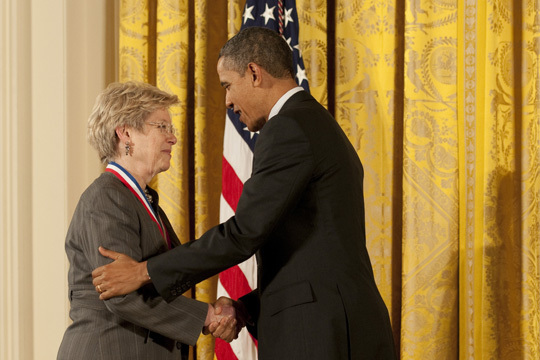 She was among 12 eminent researchers presented with the 2011 National Medal of Science Friday ceremony, along with 11 inventors honored with the National Medal of Technology and Innovation. Professors Faber and Koo have a world class research group (the DEEP team) that exploits Hubble Space Telescope, Keck telescopes and other top infrastructures to study the formation and evolution of galaxies. GUAIX researchers maintain a close collaboration with DEEP since 1989, with frequent visits and common projects. Prof. Gorgas, Gallego, Cardiel, Cenarro, Barro and Toloba have been postdoctoral researchers at UCSC, and several GUAIX members belong to the DEEP and CANDELS international collaborations.